Many owners recognize that shopping habits are changing…and not in their favor. People are shopping on line. When they do finally choose to venture away from their computer screens, they expect something more than simply a retail transaction. The article suggests that Americans today,”rather than going to big, overwhelming malls…prefer places where stores can be entered from the street, featuring restaurants, entertainment and other Main Street mainstays.” A representative from Simon Properties, one of the largest mall owners in the nation, reflects on this trend, saying malls today have to “provide a unique set of shopping, dining and entertainment experiences”. of tourist oriented retail…and a trade school. Dying malls that have made the plunge into mixed use are now home to a diverse blend of users, from schools to other civic, religious and cultural institutions. In fact, in one mall, the Galleria in Cleveland, mall owers hide the food court with a curtain and rent the space for events and weddings. Getting creative about filling space is critical to ensuring the long term value of these assets. 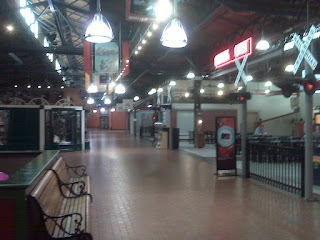 On a recent visit to Pittsburgh’s Station Square, an old school “Festival Marketplace” located within an old train depot, I noted that a significant part of the main retail floor was occupied by the Bradford School, a small school offering associates degrees and diplomas in the health care, design, technology and business fields. The execution of the concept needs a bit of help as the rest of the retail area felt old and lacked excitement, but the mix of uses helped to ensure a steady stream of customers for the food court businesses, if not for the other more tourist oriented businesses. Downtown is really no different – and our approach to filling spaces needs to be similarly creative. Of course, the greater challenge is the fact that downtowns have multiple owners who are not necessarily on the same page when it comes to vision, and seldom coordinate their actions in the same way a single mall owner can. But the real take away here is that downtown is the model for what many malls strive for these days – and it is up to us to take advantage of the authentic downtown brand that is already ours for the taking!